There are lot of person aware to take regular backup of his important data on his desktop PC for the safety. But if we talk about the Android phone, how many aware to take regular backup of his Android phone? Today we have to discuss free to use best Android backup apps for your phone which keep safe you important data. All we know very well that safety is an important part of our life. Sometime your phone will be stolen, or corrupt all data on your phone during installing the bad ROM or drop your phone in to the water. At this situation you will lost you all important data from your Android phone. Normally Google provide the facility to automatically take the backup of your all GMail, calendars, contacts for safety. But you have to use few given best Android backup apps for your phone which keep safety of your important data. This is one of the fastest and best Android backup apps for your phone. With the help of this app you will be able to quickly take backup of your contacts, apps, sms, call logs, bookmark, calender’s, Gmail and other thing on your SD card or Google drive. By default the default backup location will be internal storage of your phone. After taking the backup if your phone data are lost then you will be able to easily restore your important data. This app is already installed by above one million users and the user rating of this apps in 4.4. This app occupied approx 2.6 MB storage space on your phone and you need 2.3.3 or upper version on your Android phone. If you want to download this app then you have to click on this given link. It is another best Android backup apps for your phone. The Helium app sync and backup app allows you to sync and transfer your data to another device. The Helium app allows all the users to take backup apps, contacts, sms, important files and folders, call logs. There is no need to root your phone to use this app. All Android phone users able to easily backup his important data to the SD card or cloud storage and also sync and transfer data from other device. This app is already installed by five billion users and they gives 4.1 user ratings. If you want to install this app then you need 4.0 or upper version on your Android phone. This app occupied 5.5 MB storage space on your phone and it is available in free and premium pack both. You can easily download this app from Google play store by clicking on this given link. Titanium backup is another best Android backup apps for your phone. If you have a rooted device or want to root your Android then titanium backup is best backup for your phone. It is available in free and paid both version. With the help off free version you can backup and restore all protected and system apps, data on your SD card and many more. This app occupied 7.3 MB space on your Android phone. You need 1.5 or upper version to install this app on your Android phone. This app already installed by one billion users in his phone and they it have 4.4 user rating around the world. If you want to download this app from Google Play Store then you have to click on this link. Backup Your Mobile is a free to use another best Android backup apps for your phone. This app allows you to take backup of sms, mms, call logs, contacts, dictionary, system settings, secure system settings, wifi password, calender, user dictionry, APN, user applicaitons, bookmark and browser history. You can store backup on SD card, internal memory of your phone or also store backup on Google Drive, Dropbox or OneDrive (SkyDrive). This app occupied 7 MB space on your phone and it is already installed by five million persons. You need android 4.0 or upper version to install this app on your Android phone. If you want to download this app fro Google Play Store, then you have to click on this given link. 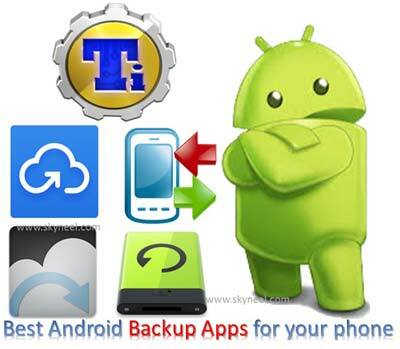 It is simple and free cloud and restored another best Android backup apps for your phone. You will get 5 GB space on your personal cloud storage after downloading the app on your phone. With the help of this app you can backup and restore your contacts, messages, call logs, photos, web browser, calendars, alarms, dictionary. This app also provide automatic backup facility on your phone. This app is required 5.4 MB space on your phone and already installed by 1 billion users on your phone. The CM backup has 4.7 user ratings and you can download this app from Google Play Store. I hope after reading best Android backup Apps for your phone article is helpful for all those users who want to keep safe his important data. If you have any suggestions regarding this article then write us in the comment box. Thanks to all.